Through the generosity of Titan Books I received a copy of Kareem Abdul-Jabbar’s novel ’Mycroft Holmes’. The author is a world famous basketball player, who later wrote several popular books and became a global cultural ambassador of the United States. The novel’s co-author is screenwriter Anna Waterhouse. The book is about Sherlock’s brother. Mycroft is in his twenties, works for the Secretary of State for War and plans to marry his first love. Abdul-Jabbar portrays the personality of the young man perfectly. His hero has spectacular abilities of observation and deduction, and he is an expert in using them. Many people’s life depends on his right decisions during the events. Mycroft also faces a great disappointment – his sweetheart, Georgiana lies to him, which shakes the young man’s world and his trust in women. Through this female character we can get a glimpse into the world of Victorian ladies. Sherlock Holmes appears in the story as well, and Mrs. Hudson is mentioned insinuatingly. The whole book is very gripping and it reads well. Its style is quite similar to Conan Doyle’s original stories. The author easily has the reader’s interest all the time; the book has no boring parts at all. We get lots and lots of information, data and details, allusions to the era, to its fashion, to the current internal affairs, and it gives an all-comprehensive picture of slavery, with all its social and moral aspects. Because of the novel’s length Abdul-Jabbar can unfold every plotline, and he keeps the readers guessing till the last pages. I especially enjoyed the long deductions of Mycroft Holmes, and his friendship with Douglas. I recommend this book to all who like Doyle’s Sherlock Holmes stories, to those who like crime stories, and to those who want to read an engaging novel. Titan Books honoured our site with generously offering our visitors two copies of Kareem Abdul-Jabbar’s book ’Mycroft Holmes’ to win. You only have to answer three easy questions, and this great book can be yours for free! After the game ends, the publisher chooses two winners and sends them their prizes. We will also make the names of the winners public. - Naturally your data will be passed out strictly for the publisher. - Send your answers and details using the form below. The game ends on the 27th of September. Good luck! "The game is afoot!" "Mycroft lodges in Pall Mall,and he walks round the corner into Whitehall every morning and back every evening." Our game has been ended. We are proud of the fact that we had contestants from several countries. Our sincere thanks to Chris Young from Titan Books, for his continuous help and support. We also thank all competitors. Don't be upset if you aren't among the winners. We'll surely run new competitions in the future. 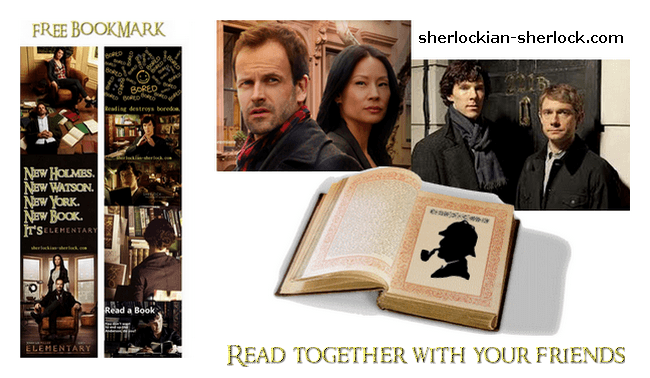 You can download free Sherlock bookmarks to cheer you up.